I've jut got back from our Sunday morning ride. We only covered around 27.52km with an average speed of 18.3km/h. Today is just a familiarisation ride of a road bike. That's why it was slow. One rider has problem with his clipless pedal that we have to stop a few times just to adjust his pedal settings. Some are still learning how to change gears because changing gears for road bike is not the same as mountain bike. Currently in our group we have eight riders. 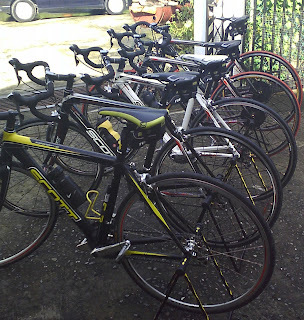 5 road bikes and 3 mtb. Pretty soon, one of our rider will buy a road bike and the other rider will buy a new mtb since he currently doesn't have a bike. He's still learning how to ride a mountain bike - changing gears, road etiquette & etc. As I've mentioned earlier, I've bought a new road bike when I was in KL last week. 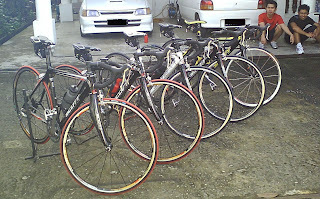 Actually my brother and I bought 4 road bikes and it cost us more than RM30K including accessories. 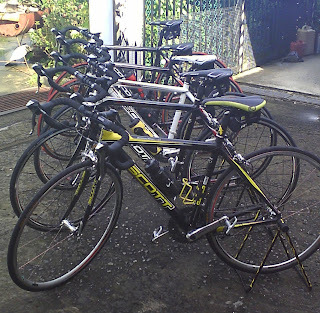 I brought back 2 bikes and my brother brought back the other 2 bikes since we went back to Brunei on a different flight. The red stripes tyres are 2008 Scott CR1 Pro. Those two at the back are our two new riders. Khiril (red shirt) - he is planning to buy a new mtb and Mursyid - His bike is the white 2008 Scott S30. I wish you Merry Christmas! !